The Nigerian Muslim group Boko Haram (meaning “book-learning – ie Western education – is forbidden”) is as savage as ISIS, of which it has declared itself an affiliate. While she was secretary of state, Hillary Clinton blocked all attempts to designate Boko Haram a terrorist organization. Why? Why did Hillary Clinton’s State Department drag its feet on the terror designation in the face of near unanimous opposition from the rest of the U.S. government? A recent series of reports exposes that a close Clinton family confidante — and Hillary campaign bundler — profited from Nigeria’s lucrative oil fields. He engaged in multiple illegal deals throughout Africa. Also, other donors to the Clinton Global Initiative are deeply involved in Nigeria’s corrupt oil industry. Were they the motivation behind Hillary’s inexplicable position on Boko Haram? As PJ Media’s Bridget Johnson has previously asked, is Boko Haram Hillary Clinton’s biggest scandal? … Why is no one in the media talking about Hillary and Boko Haram? As Reuters reported, the Justice Department’s National Security Division strongly urged the State Department to designate Boko Haram, but then a group of 21 American academics rallied to the State Department’s aid by sending a letter to Hillary Clinton strongly arguing against Boko Haram’s designation. The letter offers weak arguments. Our suspicion is that it was solicited. We also now know that the Obama administration was sitting on intelligence — obtained as a result of the Bin Laden raid — that revealed Boko Haram’s direct connection to al-Qaeda and the international terror network in 2011 and 2012. In other words, Hillary’s State Department was arguing that Boko Haram had no such connections, that it wasn’t a transnational terror threat, even though the Obama administration — and likely Clinton herself — knew that was false. And Mindy Belz and J. C. Derrick, writing at WORLD, answers Patrick Pool’s question. They find that – yes, “donors to the Clinton Global Initiative” who are “deeply involved in Nigeria’s corrupt oil industry” were indeed “the motivation behind Hillary’s [otherwise] inexplicable position on Boko Haram”. The next day, Jan. 21, the U.S. Embassy warned U.S. citizens “to review personal security measures”, and it prohibited government personnel from traveling to northern Nigeria. But tracking and cutting off the insider flow of funds propping up Boko Haram was what was needed—and the Kano attacks presented one more overwhelming reason the United States should have designated the group a Foreign Terrorist Organization, or FTO. A strong chorus rose in Washington for FTO designation — from bipartisan members of Congress to Pentagon officials (including then-head of U.S. Africa Command, Gen. Carter Ham) to a coalition of faith-based human rights groups. At the State Department, Secretary of State Hillary Clinton continued to resist it and other rudimentary steps against the terror group. Where were the funds and support coming from? In part from a corrupt oil industry and political leaders in the North acting as quasi-warlords. But prominently in the mix are Nigerian billionaires with criminal pasts — plus ties to Clinton political campaigns and the Clinton Foundation, the controversial charity established by Bill, Hillary, and Chelsea Clinton in 1997. The Clintons’ long association with top suspect tycoons — and their refusal to answer questions about those associations — takes on greater significance considering the dramatic rise of Boko Haram violence while Hillary Clinton was secretary of state. Did some Clinton donors stand to gain from the State Department not taking action against the Islamic terrorist group? Today the Houston oil exec — who retired in May as CEO but continues as chairman of the board of CAMAC, now called Erin Energy — tops the list of wealthiest Nigerians living in North America. His firm reports about $2.5 billion in annual revenue, making it one of the top private companies in the United States. In 2013 Bill Clinton stood alongside Adewale’s uncle, Bola Tinubu, while attending the dedication of a massive, controversial reclamation project called Eko Atlantic. Critics call Bola Tinubu, leader of the ruling All Progressives Congress party, Nigeria’s “looter in chief”. A Nigerian documentary says that when the billionaire landowner was governor of Lagos State (1999-2007), he funneled huge amounts of state funds — up to 15 percent of annual tax revenues — to a private consulting firm in which he had controlling interest. About the time of the Kano bombings, a lucrative potential for new oil opened up in Nigeria’s North — precisely in the Borno State region where Boko Haram has its headquarters. Beneath the surface … Boko Haram was making it possible for illicit operators to lay claim to the area for their own purposes, and to pump oil from Nigeria’s underground reserves to Chad. Using 3-D drilling, Chad operators can extract Nigerian oil — without violating Nigerian property rights — to sell on open markets. One benefactor of the arrangement is Ali Modu Sheriff, a leading politician in the North, Borno State governor until 2011, and an alleged sponsor of Boko Haram, who is close friends with longtime Chad President Idriss Déby. The very terrorism that seems to be deterring oil exploration in reality can help illicit extraction, forcing residents to flee and giving cover to under-the-table oil traders. In 2015, a year when overall oil prices dipped 6 percent, Lawal’s Erin Energy stock value skyrocketed 295 percent — the best-performing oil and gas stock in the United States. The 2014 kidnapping of 276 girls from a Chibok Christian school catapulted Boko Haram into the international spotlight and sparked first lady Michelle Obama’s #BringBackOurGirls social media campaign. “Besides military intervention, the United States has many tools for aiding Nigerian authorities. The Treasury Department’s Office of Foreign Assets Control — the unit tasked with enforcing key aspects of FTO designations — purportedly doesn’t have enough staff to focus on Boko Haram financing. The administration maintains that Boko Haram raises its funding through local means, such as robbing banks and pillaging villages, even though WORLD obtained evidence the militants have access to international bank accounts. How likely is it that the truth about the Clintons’ protection of Boko Haram will become known to the American public? Will people come and testify before the House Africa subcommittee? If they do, will they tell the truth? If they tell the truth, will the media report what they say? If the media report the truth, will Hillary Clinton have to answer for her part in the story? Hillary Clinton, she of the Benghazi Massacre, retorts when she is criticized for her actions and inactions in connection with that disaster, that “eleven hours of questioning” by the Foreign Relations Committee “found nothing” to reproach her with. It now emerges that the Foreign Relations Committee hearing was not an entirely honest inquiry to determine the truth of what happened, but in part a staged performance, scripted in advance by the Clinton gang. “We wired it that Menendez would provide an opportunity to address two topics we needed to debunk (her actions/whereabouts on 9/11, and these emails from Chris Stevens about moving locations,)” Clinton media gatekeeper Philippe Reines wrote to Chelsea Clinton the morning of the Jan. 23, 2013 hearing. Right out of the gate, the first hearing question from Menendez that day covered both topics referenced by Reines. Stevens was among four Americans killed in the attack. The emails were obtained by the group Citizens United as part of its ongoing Freedom of Information Act request to the State Department for emails from Chelsea Clinton and Hillary Clinton’s closest aides. 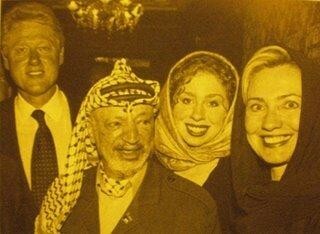 A previous release of emails from a separate FOIA action showed that on the night of the attack, Clinton told her daughter, who used the email pseudonym Diane Reynolds on clintonemail.com, that the attacks were the work of an “Al Queda-like group” – with no mention of an obscure anti-Islam video Clinton publicly linked to the 2012 terrorist attack. Chelsea Clinton uses the same pseudonym in the Menendez email. Reines is a founding member of the Clinton-aligned consulting group Beacon Global Strategies. The online bios for its founders and managing director suggest no group knows more about the Benghazi terrorist attack and the Obama administration’s response. One of its senior counselors is former CIA Acting Director Mike Morell, who heavily edited the controversial Benghazi talking points, which helped establish the administration’s initial flawed narrative about the attack. Morell recently endorsed Clinton to the New York Times, but later was criticized for not fully disclosing his relationship to Beacon. The Clintons and their hoodlums lie so consistently that they are no longer expected to be truthful. A vote for Hillary is a conscious vote for dishonesty. But why should it matter? She’s Hillary Clinton. She’s above the law. She’s beyond good and evil. She’s entitled to power and riches. And she needs to be the first woman president of America.